The US could spend more than $1 trillion (£675bn) over the next 30 years modernising its arsenal of nuclear weapons. It wants to make them faster and more accurate. Other nuclear states are trying to do the same, raising questions about their commitment to disarm. 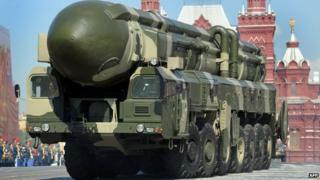 Are we entering a new nuclear arms race? The BBC World Service's The Inquiry programme hears from four expert witnesses. "It is an arms race; it's just a different kind of arms race. It's one which technological advance is the race. Nuclear countries are trying to make sure that the other nuclear countries don't get some sort of technological edge. Media captionWhich countries have nuclear weapons? "There's a reasonable argument to make that 40-year-old weapons systems are unreliable and that you don't want weapons that are this dangerous to be unreliable so modernisation doesn't seem like an inherently crazy thing to pursue. "For instance in the United States, the current plan is to replace all three legs of what is called the nuclear triad with entirely new weapons: a new land-based missile, a new long range nuclear bomber and new nuclear submarines. It's estimated to be something on the order of a trillion dollars over 30 years. Russia is undergoing the same sort of rebuild too. "The United States is upgrading its nuclear bombs to be more precision guided weapons that can be dropped from farther from target. "Because they can be more accurate the yield on the weapon can be reduced. This does create in some the fear that you can use them and not start a worldwide war." "Whether or not we are in a new arms race is maybe the wrong question. "What I propose we think about is: are the risks of nuclear use increasing or are they decreasing? And I believe we are in a period where the risks of nuclear use is increasing. Image caption Joan Rohlfing: "India might inadvertently cross a Pakistani red line"
"Nuclear risk is a function of more than just whether or not we're in an arms race. It's also a function of whether we have leaders who understand those risks. "We have a new crop of leaders who in many cases don't have the understanding of the tools that were developed through the Cold War and that is a very troubling situation. "I am a child of the '60s and '70s and I remember even as a child, going to bed at night and thinking, 'I wonder if I'll wake up the next morning' knowing there was the possibility that a nuclear weapon could be detonated over my hometown. "I think with the current generation of children, the good news is they don't live with that palpable threat. "The bad news is that because they and their parents don't live with that threat we've really lost all sense of how dangerous these weapons are and therefore we aren't managing it properly. "India and Pakistan is a particularly complex area and I think a very dangerous region of the world right now. "It is believed both of them have arsenals in the range of 100 weapons. They both have effective coverage of virtually the entirety of each other's countries. "They have not yet developed as the US and Russia did the series of constraints and signalling that managed to help provide a clear sense of where the red lines were, which I think greatly increases the danger. "The scenario I worry about most is if a Pakistani-based terrorism group entity were to attack an Indian target that you would see Indian escalation in the form of the rapid deployment of Indian forces into some part of Pakistan where Pakistan would be forced to react. "India might inadvertently cross a Pakistani red line in a way that India doesn't even understand because they haven't talked about the red lines. "You have to worry in that case that Pakistan may conclude they need to use a tactical nuclear weapon and you could see it escalating from there." "The first region that comes to mind is South Asia where both India and Pakistan are quite actively building up their arsenals, and Pakistan is talking about a sea-based leg to the nuclear forces, and talking about deployment of tactical nuclear weapons. "So yes, in that part of the world it seems like there is a nuclear arms race in a somewhat more classical sense of a numerical build-up between two countries. Image caption Gaukhar Mukhatzhanova: "If Russia decides to build beyond the levels of New START, then we might be looking at a new arms race"
"[Elsewhere] I wouldn't say that it's an outright arms race in terms of qualitative improvements, but there are some countries that are moving more actively and are quite ahead of others. "Russia is one of them. Russia is rebuilding its entire arsenal, deploying new nuclear armed submarines, new intercontinental ballistic missiles, and yes, those are new weapons. Those are not just upgrades to the previous ones, or just refurbishment of previous ones. "Whereas the United States have been doing life extension programmes for a while, and they are going to be modernising and upgrading their arsenal. "So far the United States is actually calling for reductions, and says it will be able to reduce its arsenal by another 500 warheads without it affecting its national security. "Now if Russia keeps building up, if Russia, for example, decides to build beyond the levels of New START, then we might be looking at a new arms race in a sense that we saw during the Cold War. "But I don't see that happening just yet." "We have a treaty - the Comprehensive Test Ban Treaty - that 162 countries have ratified, including Russia, Britain and France. Image caption Thomas Graham: "As long as there's no testing, there's rather strict limits on how much you can do"
"But the US has to ratify along with a few others that are waiting for the US, such as China and Israel, for it to come into force by its terms, and legally ban testing worldwide. What we have now is an informal moratorium introduced by President Clinton in 1993 that other nations, everyone else is more or less following except for the North Koreans. "As long as there's no testing, there's rather strict limits on how much you can do. And so yes, perhaps you could call it a new type of arms race, but it's very limited in scope. "If that ever breaks down it won't be like the Cold War, but it'll be plenty dangerous." The Inquiry is broadcast on the BBC World Service on Tuesdays from 13:05 GMT. Listen online or download the podcast.